Hoist and Crane Systems from Wisco Supply, Inc.
Hoist and crane systems are essential in many different industries, including construction and urban development. That being said, when it comes to purchasing the right machinery and equipment for your business and the job at hand, it’s important you purchase the best available in the industry from a reliable supplier who can help you find the best equipment for the job! If you’re looking for the best, Wisco Supply, Inc. is here to help. For decades, we have provided the southwest region of the United States with high-quality products and superior customer service that can’t be matched anywhere else. So if you work in an industry that requires the best in hoist and crane systems, we’re the place to call. Cranes and Monorails– An essential part of many supply chains, cranes and monorails make moving loads within a factory much easier to do, especially if they are heavy. Hoists– Hoists are used in conjunction with other equipment to lift and move heavy objects. Cranes– Cranes are used in all kinds of industries, from warehouses to construction sites, to lift, move, and place heavy objects. Crane Electrification Systems– Many cranes are electric and require electrification systems to function properly. We’ve got you covered when it comes to finding the right system for yours. 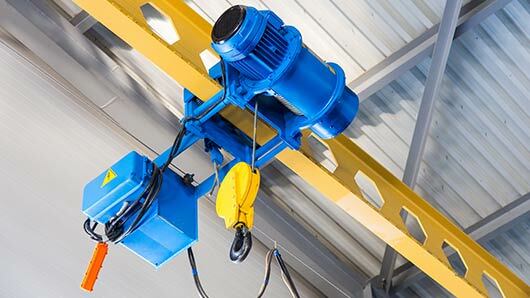 Hoist Electrification Systems– We also offer hoist electrification systems for hoists that require them. Hoists and Bridge Components– If you’re looking for specific parts, specifically for the bridge component of your hoist or crane, we can supply them to you. These manufacturers produce great pieces of machinery and equipment. From monorails and cranes to hoists and parts and components, they manufacture equipment of the highest quality. We understand how important reliability and durability are when it comes to lifting heavy items, which is why we trust these partnerships to provide you with exactly that! If you’re in the market for new hoist and crane systems, and their accompanying parts, we’re the place to call. We only acquire equipment and machinery from the best in the crane and hoist manufacturing industry, so you can rest assured knowing you are getting exactly what you need from the best sources possible. We’re a one-stop shop for all of your industrial equipment needs, so don’t wait. Give us a call today and we’ll be happy to help you!